A few weeks ago I went out to a little café for lunch and I had a lovely curried chicken breast burger. It tasted so good I decided to make my own version of it, adding a few little Indian accompaniments. Feel free to serve the burger with whatever you fancy….rice, BNS wedges, coleslaw etc or give my accompaniments a whirl. They are quick and easy and lovely and fresh. Pop all the marinade ingredients in a large bowl a mix. Pop the chicken breasts flat between some baking paper and flatten by bashing with a rolling pin. Then pop the chicken in the marinade, coat, cover and pop in the fridge to marinade. Leave for as long as you can (overnight if possible) but I only left mine while I prepared the saag aloo and salad and it was still lovely. While the chicken is marinading, make the saag aloo. Par boil the potatoes for 6-7 minutes until they have started to soften and then drain (this will quicken up the whole process). Then take a frying pan, spray with 1kal and a dash of water and then add the mustard and cumin seeds and fry for a few minutes until fragrant. Then add the onion and fry for around 5 minutes until soft (adding water if needed to stop them sticking). Then add the garlic, ginger and chilli and fry for a few more minutes. Next add the turmeric, garam masala and ground coriander stir and then add the potatoes and tomatoes, stirring in. Season well. Add in a drop of water to loosen and begin to cook on a medium heat, stirring regularly until the potatoes are cooked through and the potatoes start to absorb the spices. Keep adding a drop of water here and there if needed to stop it getting too dry. Once the potatoes are cooked through (around 10 minutes), add the spinach, let the heat wilt it a little and stir through. Finish with a squeeze of lemon. Keep on a low heat until everything else is ready. Pop all the salad ingredients in a large bowl and pop in the fridge. Pop the chicken (coated in the marinade) on a baking tray, season and pop under a hot grill for 7-10 minutes. Turn and cook until the chicken and marinade starts to brown up nicely and is cooked through. Take out the oven to rest. Pop the Warbie thin under the grill for a minute on each side. Pop one half on the bottom of the plate. Add a little of the mint yoghurt, top with the chicken, a little red onion and fresh coriander, a little more mint yoghurt and then the other half of the thin. 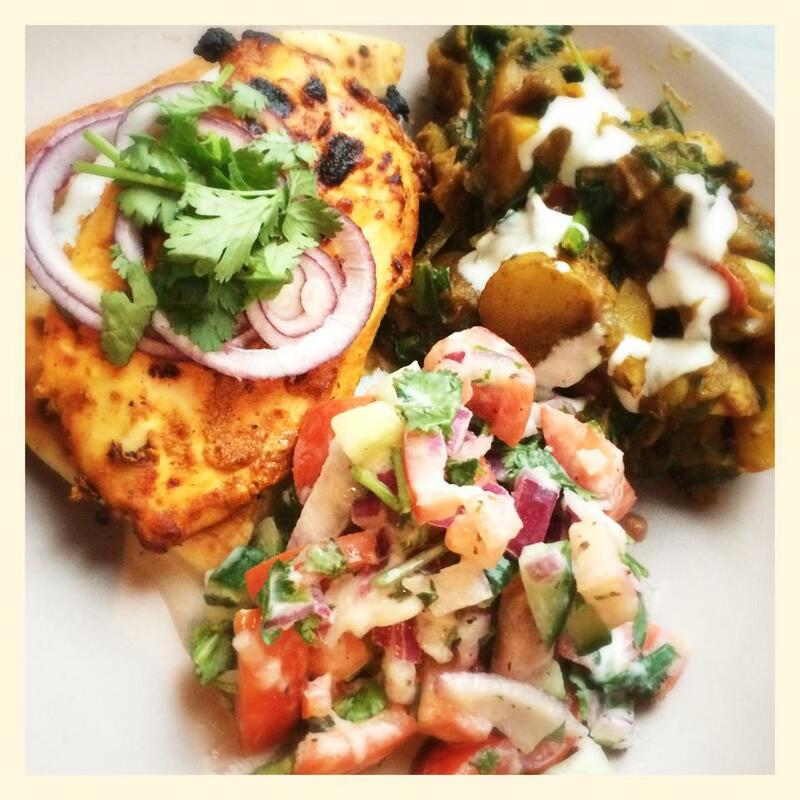 Serve the burger with the saag aloo and salad and an extra dollop of mint yoghurt if you fancy. Thank you so much. I have just had this for supper on day 1 (!) of my WW journey. It was absolutely fab. We loved it! Really delicious and very filling. My husband and kids loved it too. Fabulous recipe, such a lot of food! I loved all of the spices & the Indian salad was a real surprise taste wise! Made this for tea tonight omg it was amazing, one of my favourites. Took longer than most of the recipes but well worth the time.